Earlier this week, I had a code review. It was only my third code review in over 5 years of working as a software developer. I had to repeatedly nag to before it actually happened. It says something for the state of software development, and the lip service paid to developing quality software solutions, that is by no means uncommon for developers in Northern Ireland. Note, in the past 5 years, I have worked for 3 local companies, one an international IT Services company, all of whom pride themselves on delivering quality code. In my last job, I was never given a code review. Never. My view on code reviews, and the less formal pair programming, is that it is a fundamental learning activity for people who make their living cutting code. And I’m not alone in that view. How can you improve if you don’t know what you are doing wrong? 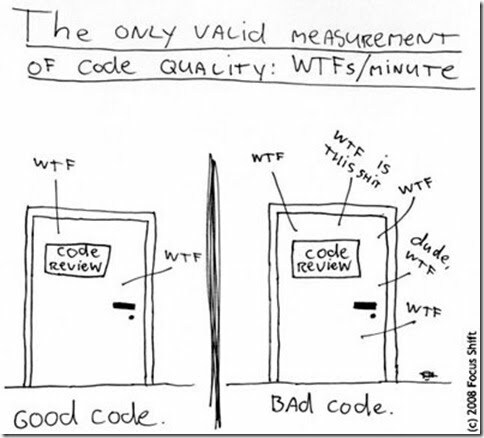 Code reviews are also the best way to ensure the quality of the code that you write. Nothing focuses the mind on writing quality code more than the knowledge that you will be held accountable for the code you check in. If code reviews aren’t happening regularly, the code quality goes out the window. And if your company isn’t doing code reviews formally, you need to start doing them informally. My biggest regret from my last job is that I didn’t arrange informal code reviews.